Art Deco posters are highly collectable and the most sought after were produced by the innovative artists of the Art Deco period. However, good quality colour printing was expensive in the 1920’s and 1930’s consequently most advertising posters tend to represent luxury goods and services. Such as those from the more expensive Bentley, Bugatti and Rolex brands or luxury cruise liners. So, original art deco posters, possibly recovered from the halls and reception rooms of great art deco buildings and the great ocean going liners, are prohibitively expensive. 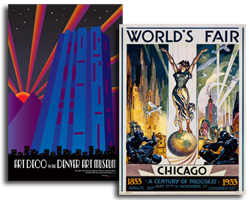 For most of us the next best alternative is a top quality reproduction of the classic images from the art deco period. The best of which when displayed correctly, will artfully re-create the look feel and ambience of the true art deco interior.